1. Peel and slice 2 of the oranges and place them in a large heatproof dish with the easy peelers slices. Use a vegetable peeler to pare strips of zest from the remaining 2 oranges then halve both and squeeze the juice into a measuring jug. There should be 200ml juice — if not, make up the difference with water. Now add an extra 50ml water, taking the level up to 250ml. Set aside. 2. Put the sugar in a large saucepan with 200ml cool water. Heat through gently, stirring to dissolve the sugar. Stop stirring, increase the heat and bring the liquid to the boil. Simmer briskly (do not stir or the sugar could crystallise) until the syrup turns a deep amber colour and smells caramelised. Remove from the heat and add the orange juice and water mixture, being very careful because the pan will steam and splutter. Stir in the orange zest with the vanilla pod and seeds. 3. Keep stirring to dissolve any lumps of caramel — you might need to return the pan to a gentle heat to dissolve them fully — then set aside to cool for 10 minutes. Pour over the fruit and chill for at least 2 hours or up to 24 hours. 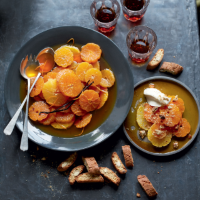 Serve chilled, with cantuccini biscuits and spoonfuls of crème fraîche or mascarpone.